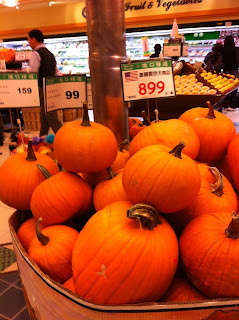 If you've been wondering where to get some pumpkins to carve for Halloween, Jason's Supermarket at Taipei 101 has super huge ones that could rock some scary faces. They also have more manageable mini ones behind it. Wandering around 101 food court, I was struck by all of the changes- I probably hadn't been in about 6 months or so. One of the most exciting is that a huge new Din Tai Fung that opened in July. The new Taipei 101 location is supposed to be the biggest in the world, with over 300 seats and 8 private rooms. And the xiao long bao baskets still have 10 per basket unlike the Fuxing Sogo location which has only a measly 6 per order. New Elite Bakery with fancy cupcakes. No more Lugar Home Bread Bar (which I never got to blog about). No more Dunkin Donuts next to Jason's. No more Flavorfield bakery, instead a different, new bakery will open later this month. What's your favorite thing to eat at Taipei 101? I wish I had gone to this DTF location! We went to the original one, and weren't too happy with the service. Also for some reason the dumplings didn't seem as magical. In 'ATT for fun' (or whatever we should call it - the mall next to Warner Village, which used to be New York New York) there is going to be a branch of South Beauty. I've eaten in the Beijing and Shanghai branches, which I thought were really good, so I'm looking forward to trying this one. Would love to hear what you think too!